It’s very common to see invoices for $100 but only $97.50 in your bank account because of a Merchant Fee of $2.50. Here are some ways to handle this in Saasu to account for the reduced cash received against the sale. Note: The fee field options for handling payments is intended for merchant fees on sales. The amount in the fee field is a negative amount. In the Automate > Bank Feed screen you see a transaction for a lesser amount than your Sale. eg. say for example you have a sale for $100 and the bank feed comes with with a received amount of $97.50. Click on the amount of the transaction change it to $100. You will see that there are now 2 lines for that transaction, $97.50 and $2.50 Fee. You can then match that transaction to an unpaid sale or create a new sale. Go to View > Sale Payment. 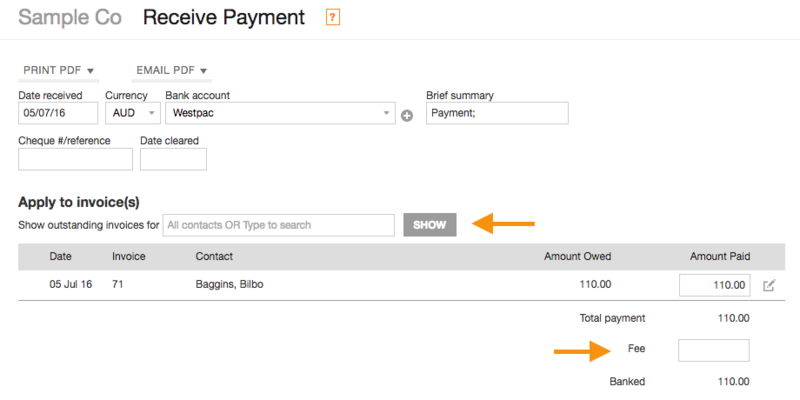 Search for the invoice to apply your payment to in the “Apply to invoice(s)” section of the screen using the search field and show button if it’s not already listed there. Enter the fee charged by your merchant in the “Fee” field. You’ll notice that Saasu adjusts the “Banked” amount by the fee which will allow Saasu to match to your bank feed item (if you use bank feeds). Create a bank account named Asset: Amex Clearing (or similar). Create an account named Expense: Amex Fees (or similar). Apply payment to the sale in full using the Asset: Amex Clearing bank account. The benefit of this method is that you get one number in the bank reconciliation. This is handy where it represents several credit card payments from customers. You can make sure the ABC Bank Clearing account is balanced over time as a check that may prompt a query that the merchant hasn’t paid. Another approach is to bulk enter the fees deducted by your merchant as a single journal each day, week, or month to save doing a journal for each transaction. This can save some time but might lead to difficulties in reconciliation, so it may or may not work for you. Why can’t I just reduce the original transaction value by the merchant fee? You may want to show actual sales at their true gross value for compliance changing transactions already issued to customers is not normal accounting practice.